My best selling book, Veterinary Secrets Revealed is going up in price Soon. If you have not yet scooped up a copy, go now to http://www.veterinarysecretsrevealed.com and Click the Big Order link at the bottom of the page..
Pets have become a HUGE part of our society. They are part of our family, and finally are starting to get the recognition that they deserve. I LOVE writing about pets and animals. I actually read about pet health in my spare time- I am a sucker for a sappy pet movie. Benji..Dr Dolittle..The Truth about cats and dogs..
My point is that I practice what I preach. And that brings me to today’s newsletter.. 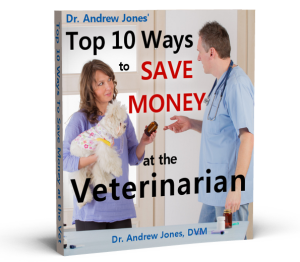 The Top 10 reasons WHY you should be using Veterinary Secrets Revealed.. So You Can You Treat Your Pet When They Need Your Help Most.. Most pet owners have no idea how to perform CPR, or even begin to give basic medical care to their pet. But you should know these things, because in some emergencies, you can’t always get to the Vet in time. What frustrates me is… that my colleagues and I in the Veterinary profession haven’t done a good job educating people about how to care for their pets. You as a dedicated pet owner are NOT encouraged to care for and treat your pet at home. In fact I doubt that any of you have been given any alternative options when visiting your veterinarian. Veterinarians profit by YOU taking the ongoing medication. If you bring in your 13 year old cat who has been eating more and losing weight, your cat will get tested for hyperthyroidism. The traditional veterinary treatment for hyperthyroidism is daily tablets- called Tapazole. They have serious side effects, such as vomiting, diarrhea, and bone marrow suppression which can result in death. You won’t find them anywhere else. I’ll leave you with this fabulous testimonial.. I purchased your ebook after roaming around the internet desperate to find information on how I could help my Persian cats (litter mates) fight early stage renal failure. My Vet had done all the testing but then offered no help other than get them on a “urinary diet”. I wanted more and knew there had to be someone out there who could help. After purchasing the book, I was able to get the simple medications at health food stores or in the instance of Tums, at the grocery store! To make a long story short, both of my cats (16 years old) are doing great and my regular Vet doesn’t get it!